A package arrived at my desk today and it was quite a big box (I placed the pencil there for reference). 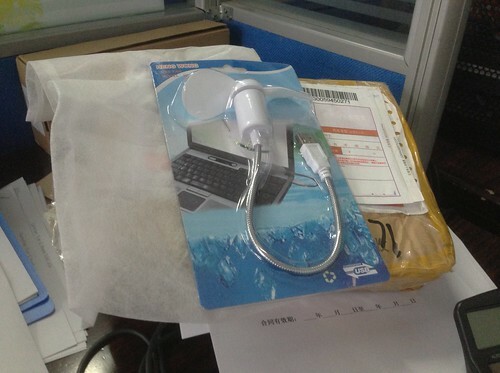 When I opened it, I felt a little cheated as it was only the USB fan that I bought. Alamak, pack such a big box for what? I know I have a USB fan heading my way but I didn't expect this package to be it. First of all was the size of the box and second of all, I only ordered the thing the day before. Totally didn't expect the shipment to be that fast. Gotta love the logistics speed here in Da Hu. It is the norm that you get your orders delivered overnight. 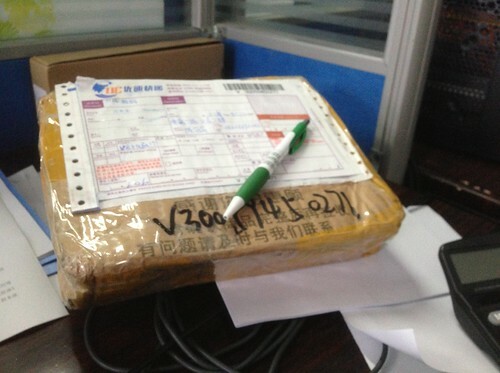 Such is the intensity of the competition as far as online shopping is concerned. 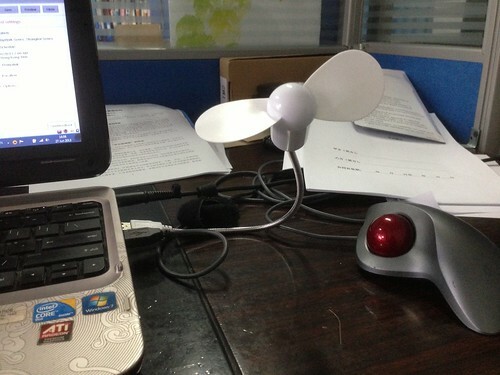 Anyway, if you recall my entry last year, that freebie USB fan died the day before. It was a good run while it lastest, especially since it came for free. This new one? A mere RMB 7.80 (SGD 1.60) including shipping. The downside is that it does not have a standing base i.e. it is very near to your hand while you are typing (which is not really a problem since the blades are very soft but nevertheless still gives you a shock when you stray into its path). Also, an ON/OFF switch would be nice. One has to remove the entire fan to get it to stop. Not a big problem for such a small sum of purchase. LadyRed: You mean the engraving ah? That one is supposed to be clouds ala Chinese art style. LadyRed: no choice since it was the only tablet laptop within my budget that time. It was mistake.